Savannah is known for its beautiful cobblestone streets, horse-drawn carriages, and centuries-old trees draped in Spanish moss. In fact, visitors often say the entire Historic District looks like something straight from the pages of a storybook! Factor in the vibrant art scene, incredible restaurants, and numerous sites of historical significance, and you’ll see why it’s a great place to visit. 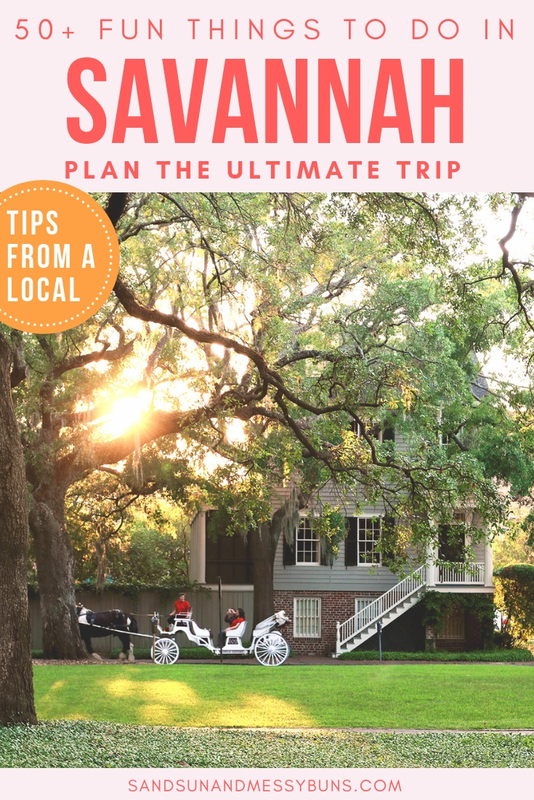 Here are a few things to do in Savannah if you decide to make a trip anytime soon (which I highly recommend you do)! If you find this post helpful, please share this image on Pinterest. Keep in mind that there's so much more to the city than what's listed here! This checklist is just a starting point. I've listed some unique things to do in Savannah, as well as some of the most popular restaurants and tourist attractions for first-time visitors. The list is interactive, so you can check each item off as you visit! Oh, and if you're new here…Hi! I'm Erin, and I live in Savannah. I wrote an ebook about the city, I have an “I ❤️ FOXY” sticker on my fridge, I live in a potentially haunted house in the Starland District, and more than 50% of my annual income goes to SCAD — so I guess all that makes me fairly legit at doling out advice on what to see and do around these parts. You can rest assured you're getting current info, and that I'm not just some random blogger who visited the city once and then whipped out a post about how you should go eat at Paula Deen's restaurant. I truly think one of the best things to do in Savannah is wander around and admire all the beautiful architecture. My friends always remember “all the pretty houses”, and they always want to plan a return trip to see even more of them! Prefer a self guided walking tour? Jones Street is often labeled as one of the “prettiest streets in America”. It's a great place to begin your journey. From there, head south to stroll along Taylor, Gaston, and Gordon Streets. You'll be far enough removed from the more touristy areas that you'll get a true sense of the Historic District's charming neighborhood appeal. FYI: I post tons of house pics on my Instagram account! Want to take a peek inside some of the beautiful homes in the Historic District? There are a few times each year when homeowners open their doors to the public. 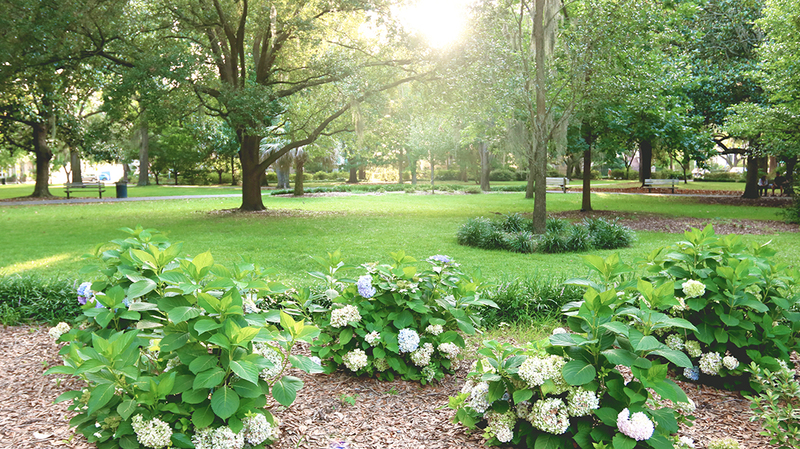 Try the Savannah Tour of Homes & Gardens in mid-March, the Savannah Garden Club's Tour of Hidden Gardens in mid-April, and the Downtown Neighborhood Association's Holiday Tour of Homes in December. FYI: Many of these sell out MONTHS in advance. The Savannah College of Art & Design (SCAD) is largely credited for breathing life back into the city of Savannah in recent decades. The school's impact is apparent throughout the Historic District — and well beyond. ShopSCAD | 340 Bull St. The shop is located on the ground floor of the SCAD Welcome Center in Poetter Hall and is full of one-of-a-kind creations. You'll find beautiful jewelry, paintings, photography, illustrations, leather, and more from students in many of SCAD's illustrious design programs. Just a heads up: The store is pricy. (Kids gotta pay back that hefty tuition, yo.) You can also commission an artist to create a custom piece via SCAD Art Sales. Or just find a random student and ask them design something for you for less than half the cost to totally make their day. SCAD Museum of Art | 601 Turner Blvd. The museum features rotating exhibits of contemporary art that change with each new academic quarter. The Guo Peì Collection exhibit was a favorite of recent options, but there's always something new and exciting to check out. 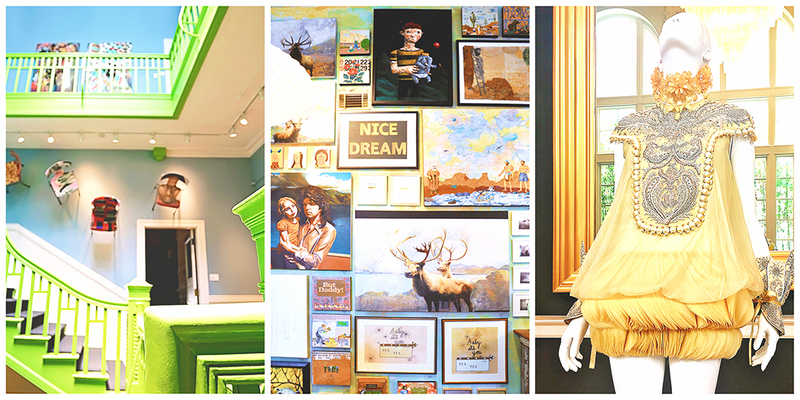 See what others have to say about SCAD's Museum of Art on TripAdvisor. SCAD students bring such an air of vibrancy to the city! You'll spot them on colorful SCAD busses, walking to and from classes, and darting through traffic on their bikes. It's fun to play “spot the major” to see if you're able to tell the difference between fashion design students, film majors, or illustration artists just by a cursory glance at the clothes + hair. [Left] Entering SCAD's Welcome Center in Poetter Hall is a lot like stepping through the looking glass in Lewis Carroll's Alice in Wonderland. [Center] Original art available for purchase from students attending the Savannah College of Art & Design. [source] [Right] One of the beautiful and intricate Guo Peì designs on display at the SCAD Museum of Art. Did you know Savannah is home to not one, but TWO of Southern Living's ‘Best Shops in the South'? You'll find clothing boutiques, home decor, unique souvenirs, and lots more. Located in the heart of the Historic District, One Fish Two Fish is a great destination for accessories, local collectibles, and beautiful home decor accents. 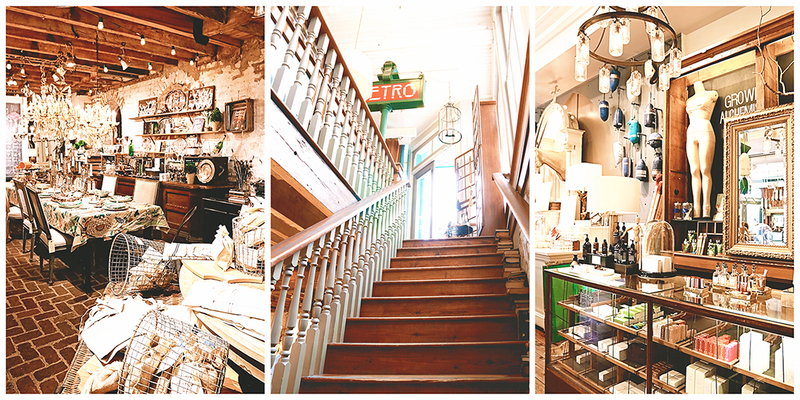 We've written about our love for Paris Market before, and it's considered one of the must-see stores in Savannah. Related: My Savannah Shopping: The Essential Guide to Broughton Street post will fill you in on Paris Market and some of the best boutique shopping in the city. You'll find an eclectic selection of treasures in The Paris Market & Brocanté…including a Paris Metro subway sign! 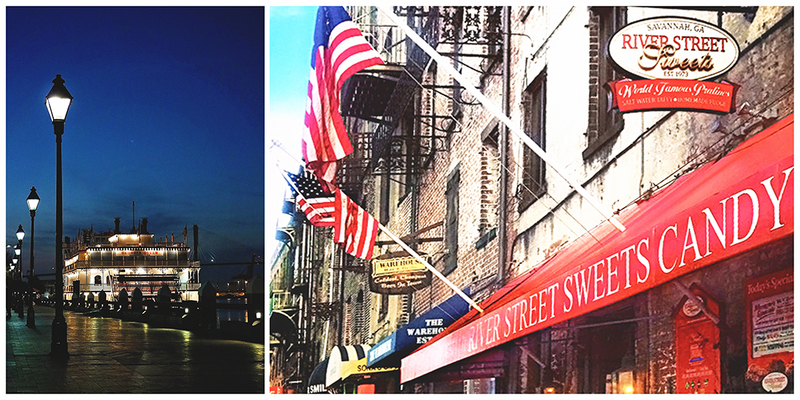 River Street is famous for hosting the 2nd largest St. Patrick's Day festival in the U.S. The city's open container law allows guests to wander the streets with drinks in-hand, and visitors really get into the spirit of the holiday. (Trust me, no outfit is too crazy!) Better book your hotel early, though. It's next-to-impossible to find Savannah accommodations in mid-March! I've mentioned my family's love for River Street Sweets many times before, but this shop is a must when you're in town! 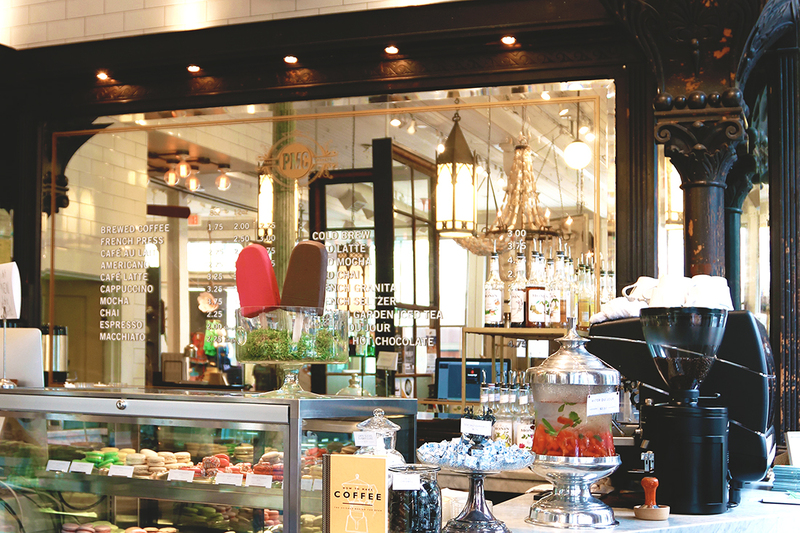 Read more about my favorite sweets shop in Savannah, and be sure to taste the free praline samples. Related: Read my in-depth guide to River Street to learn helpful insider tips about this particular area of the city. The River Street area used to be a shipping port (and still is — a very busy one, just further west past the Talmadge Bridge), but the current area tourists flock to is beautifully renovated. You'll find original cobblestone streets and historic buildings full of character. Be sure to stop by River Street Sweets for free samples of the best fresh pralines you'll ever taste! Their selection of sweets is unreal and the staff is incredibly friendly. INSIDER TIP: If you prefer to see Savannah from the water but want to save a buck or two (and all the fuss), just take one of the Savannah Belles ferry boat rides. You'll get the same view as the Georgia Queen — for free. I can think of at least 10 museums in Savannah off the top of my head. I'm sure there are probably 5 more that aren't coming to me at the moment. At any rate, you could stay for a full week and not run out of museums to tour! Prohibition is my current favorite. Purchase a Telfair pass and gain access to these 3 museum experiences for the price of one. This contemporary art museum is ideal for for families with kids in tow. They'll enjoy the interactive ArtZeum, where they can construct buildings with architectural blocks and create art pieces of their own. The Jepson Museum is currently home to the famous statue featured on the cover of Midnight in the Garden of Good and Evil. The oldest museum in the South, this former mansion was built in 1818 for the son of Georgia governor Edward Telfair and now houses American & European art from the 19th & 20th centuries. Designated a Historic Landmark, this home turned museum explores the complicated relationship between wealthy homeowners and their slaves during the 1800's. The carriage house is the only still-intact former slave quarters open to the public in Savannah. At one point 14 enslaved workers lived on the property. Ralph Mark Gilbert Civil Rights Museum | 460 MLK Jr. Blvd. I suggest beginning here if you're interested in learning more about Savannah's history with slavery, segregation, racial inequities, and civil rights. The museum has very powerful and thought provoking displays, such as an interactive one where you're able to sit in a cafe and be served as a “white” or “colored” person. I always recommend sightseeing tours for first time visitors! They're a great way to get an overall feel for a city. Once you've done that, you can decide where you'd like to focus your time during your stay. 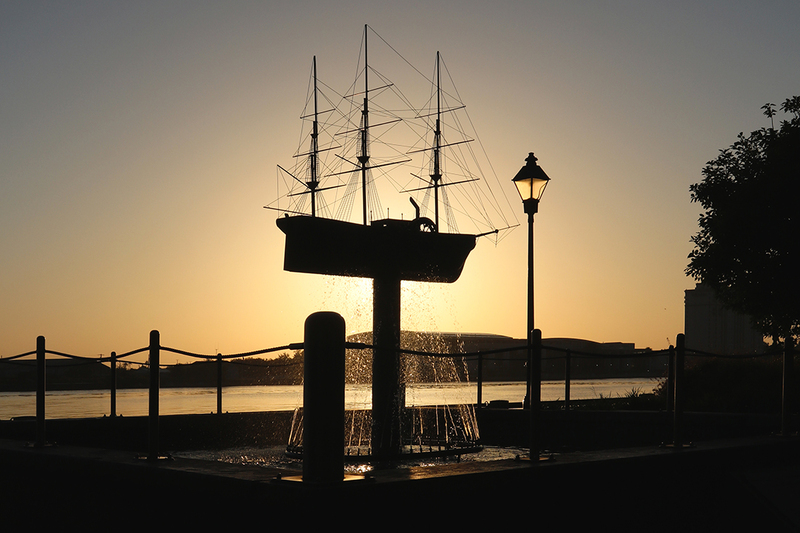 If one of your top reasons to visit Savannah is to scope out paranormal activities, you won't be disappointed! Tracking down ghosts is one of the city's most popular tourist attractions. A hop on/hop off tour bus is a great way to see the city, particularly during the hot summer months. The trolleys depart from the Savannah Visitors Center every 20 minutes, and I suggest taking the tour all the way around the city once to decide which of the drop-off points interest you most and warrant further exploration. Savannah is a highly walkable city. 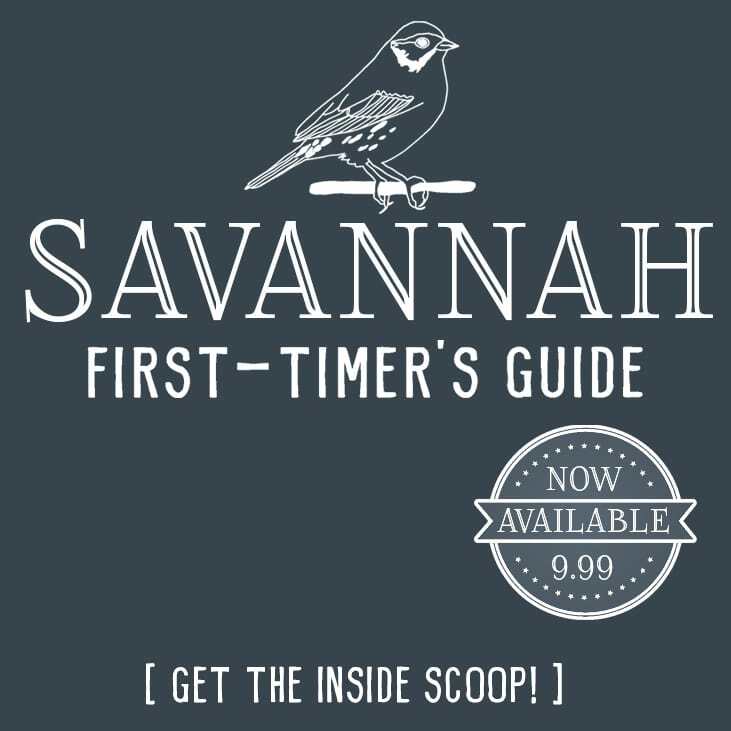 Download a map of the Historic District, then set out on foot to discover Savannah's charm and beauty for yourself! NOTE: It's best to stick to the heavily populated areas (like River Street) when exploring at night. I'd caution against wandering the neighborhoods after dark unless you're accompanied by someone who is familiar with Savannah. There are currently 22 squares throughout the Historic District and a few larger parks scattered about the area. The squares provide much needed greenery and a quiet place to rest amidst the commotion of the city. Forsyth is undoubtedly the most recognizable park in Savannah and is home to the city's most photographed fountain. It's a popular elopement spot, so you might get lucky and catch a wedding in progress during your visit! The south side of the park is where you'll find the Forsyth Farmers' Market every Saturday morning from 9 – 1. This probably ranks as my personal favorite square in Savannah. It's in a peaceful area and makes a great spot to relax under centuries-old oaks draped in Spanish moss. Pulaski is one of the few squares that doesn't feature a monument or fountain. It's common to see horse-drawn carriages circling Savannah's parks and squares, and the plant you see on the trees is called Resurrection Fern. It only appears after a good rain. 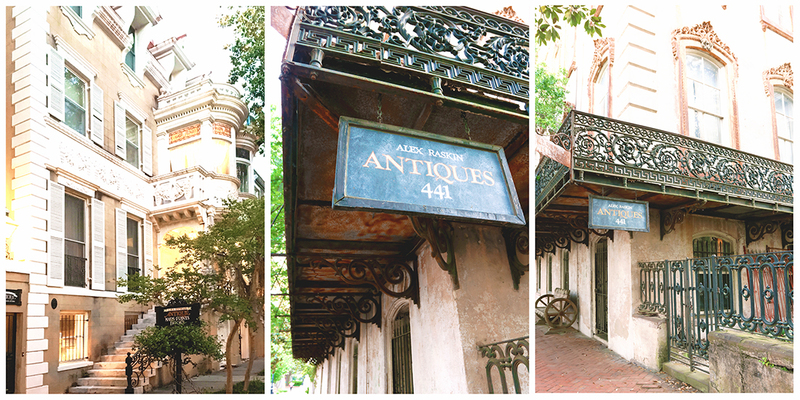 Savannah has one of the most beautifully restored historic downtown areas within the U.S. There are also numerous points of historic interest just outside the city limits. Wander down the 1.5 mile “Avenue of the Oaks” and you'll feel like you've stepped back in time about 100 years. Descendants of Noble Jones, the original owner and an early settler of the Province of Georgia, still reside on the property. [Note: Like many plantations in the Lowcountry, the property once actively participated in the practice of slavery.] The beautiful antebellum mansion is out of site and can't be toured, but the site's wooded trails, Colonial area, and the museum & gift shop are all open to the public. Wormsloe is about 10 minutes outside of town. INSIDER TIP: If you're only able to squeeze in one museum tour while visiting Savannah, Pin Point gets my vote. It's about 25 minutes outside of town, but it's well worth the trip. From SCAD's Sidewalk Arts Festival to the Savannah Art Walk, you'll find artists expressing themselves nearly everywhere in Savannah. There are numerous galleries throughout the city and a variety of classes in almost every art genre. Thanks to SCAD's presence and a thriving local art scene, you'll find colorful murals scattered throughout the city. Most of my favorites are in the Starland Arts District, including the beautiful Georgia Bees mural by Mary Lacy. Once a single-family home, the Mansion on Forsyth currently operates as a 5-star hotel. The historic building houses a carefully curated art collection of more than 400 original pieces. | Check current rates. This is where I purchased my first home in Savannah! It's within walking distance to a plethora of fun and funky shops, such as Graveface Records & Curiosities, House of Strut, and Foxy Loxy Cafe. The district hosts a monthly art walk known as First Fridays. 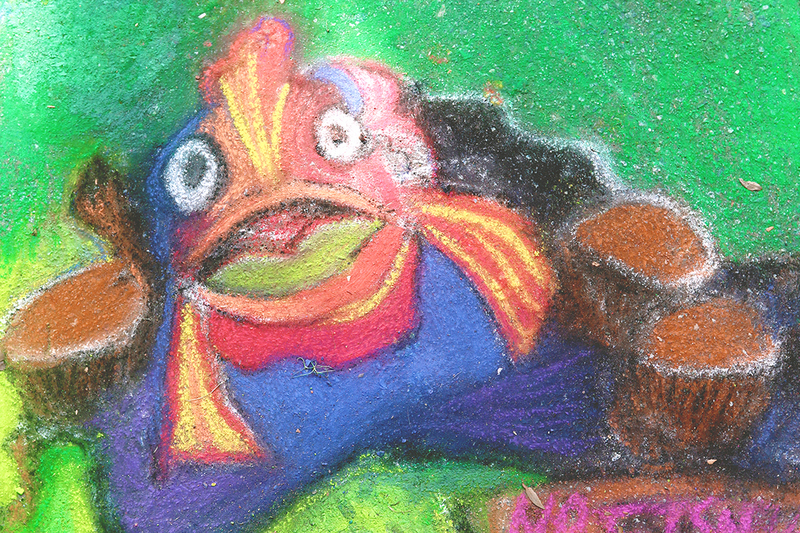 [Top] SCAD's Sidewalk Arts Festival [Left] A section from the Georgia Bees mural. 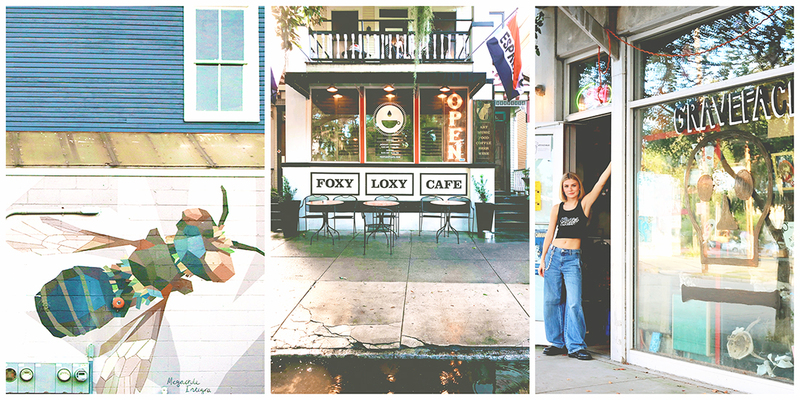 [Center] Foxy Loxy is the perfect place in Starland to stop for tacos and acoustic music on the patio. [Right] Graveface Records & Curiosities is the kind of store you'll get lost in for hours! The lines are always out the door at Leopold's (even during the winter months). Set aside plenty of time if you plan on grabbing a cone at the South's most famous ice cream shop. Lulu's Chocolate Bar | 42 Martin Luther King Jr. Blvd. Grab your girlfriends and top off the evening at Lulu's Chocolate Bar. The bar serves everything from chocolate covered strawberries to chocolate martinis to white chocolate creme brûlées. It's a sweet way to end an evening. INSIDER TIP: If you want a taste of Leopold's but don't need the accompanying Broughton Street selfie, grab a cone at the kiosk at the Savannah Airport on your way out of town. Two Tides Brewing Co. | 12 W 41st St. This one's in my neck of the woods and makes a great spot to chill out and sample handcrafted beer. Dogs and kids are also welcome! It once served as an artillery storage facility, but you'd never know judging by it's current modern and eclectic design. The building is stunningly beautiful. The bartenders are also the owners and they go out of their way to be welcoming and make helpful suggestions from their extensive craft cocktail menu. Y'all know me by now; I don't recommend the fancy places. I'm all about that laid-back vibe, and Abe's is the perfect little neighborhood bar for relaxing with friends. One of the best ways to experience Savannah is through the food, and you'll find incredible restaurants throughout the city. For a true taste of the Lowcountry, here are 3 options that have stood the test of time. This no frills restaurant is in the heart of the Historic District. It serves some of the heartiest breakfast options in town! Fans of the movie version of Midnight in the Garden of Good and Evil may spot a few familiar faces in the many photos blanketing the walls, as the cast frequently dined at this spot while filming in Savannah. In the true spirit of the South, at Mrs. Wilkes' you'll get to know your neighbors by dining together family style. (It's reminiscent of grandma's Sunday brunch — only with strangers.) The food consists of Southern-style favorites like fried chicken, black-eyed peas, mashed potatoes, and mac n' cheese. President Obama once made a surprise visit to Mrs. Wilkes' while on his “White House to Main Street” tour. **Note: Arrive early and prepare to wait in a very long line outside! 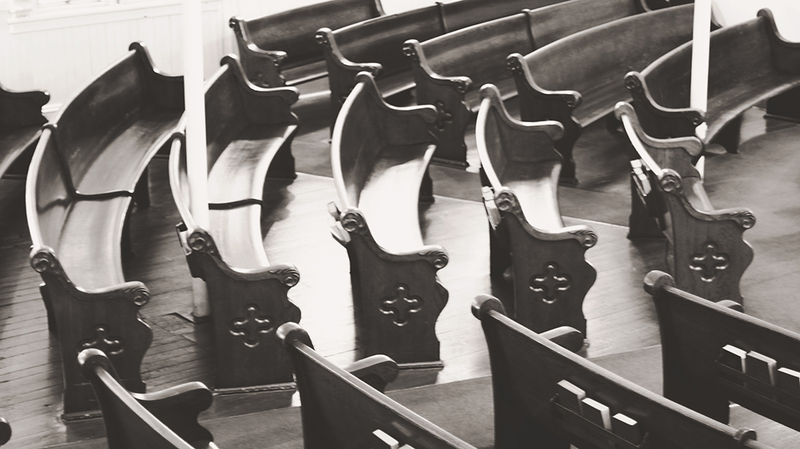 When you live in the Bible Belt, church isn't just something to do on Sunday morning…it's a way of life. 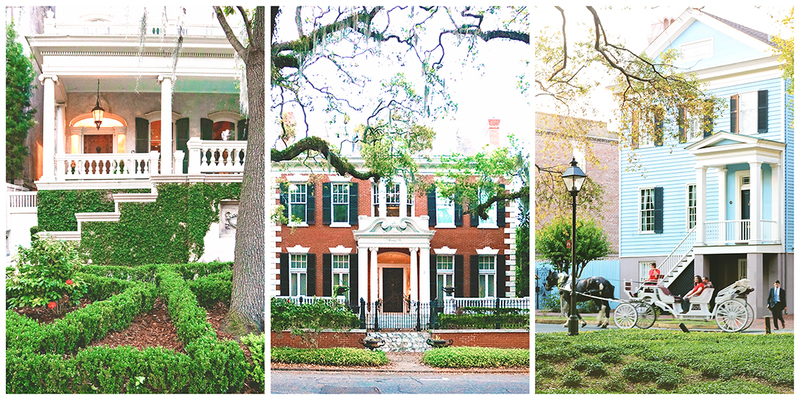 You'll find one on nearly every block within Savannah's Historic District, but I consider a few as “must-see” items on your Savannah Bucket List. The twin spires of this magnificent cathedral are an iconic landmark in the city's skyline. The beautiful vaulted ceilings, hand-painted frescos, and stained glass windows rival many European cathedrals. NOTE: The cathedral closes for an hour each day at noon for mass. 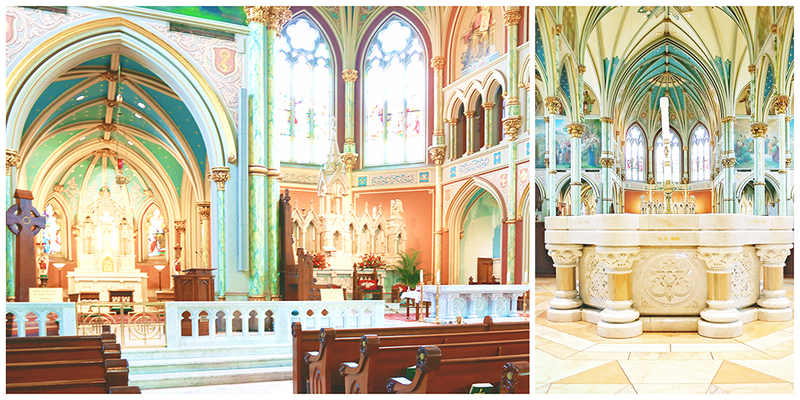 The history behind this church is incredible and not to be missed when visiting Savannah! You'll develop a deeper appreciation of the struggles African Americans endured in their quest for freedom from slavery. You'll also learn the important role this church played in the Underground Railroad. This tour is a must! The interior of The Cathedral of St. John the Baptist is almost too beautiful to describe. You have to see it for yourself! The top B&W photo is of First African Baptist Church. This cozy little bookstore often hosts local authors for signings and is a great place to curl up with a good book. Just make sure you don't mind cats! Mr. Eliot and Bartleby, the resident felines, have full run of the bookstore. Locally owned for 40 years. You'll definitely want to duck in Savannah Bee Company to sample every flavor of their locally-harvested honey. The award-winning Tupelo Honey is a best seller, and I personally love snacking on fresh slices of their honeycomb. 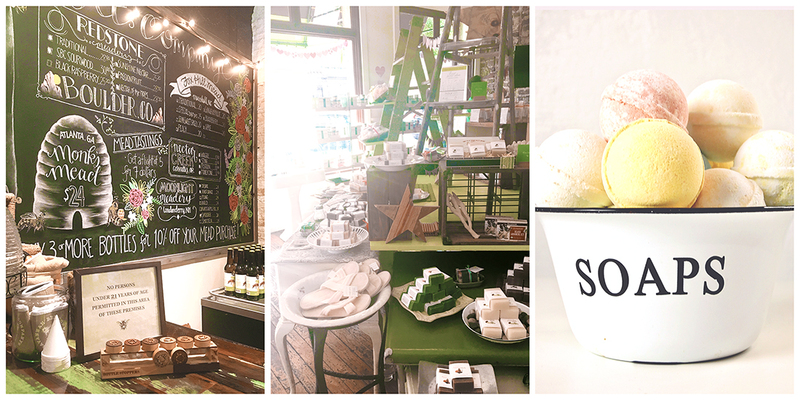 The bath fizzies, hand scrubs, and soaps in this store are organic and made locally. Southern Magnolia, Mint Julep, Hibiscus, and Coconut Lime are just a few of our favorite fizzies. You can't go wrong with any of the options! The employees at Nourish are consistently friendly and welcoming, which only serves to enhance the shop's warm and inviting ambiance. [Left] The mead tasting area towards the back of the Savannah Bee Co. is a popular hangout. You can also “adopt” a honey bee at any of the checkout registers. [Center & Right] Handmade soaps and bath fizzies from Nourish. The marquee lights of the historic Lucas Theatre are hard to miss. SCAD currently manages the theatre, which opened in 1921. It's host to the Savannah Film Festival, the Savannah Music Festival, and the Savannah Philharmonic. Situated in the heart of the Victorian district, this 1899 home currently serves as a popular wedding and corporate events venue. 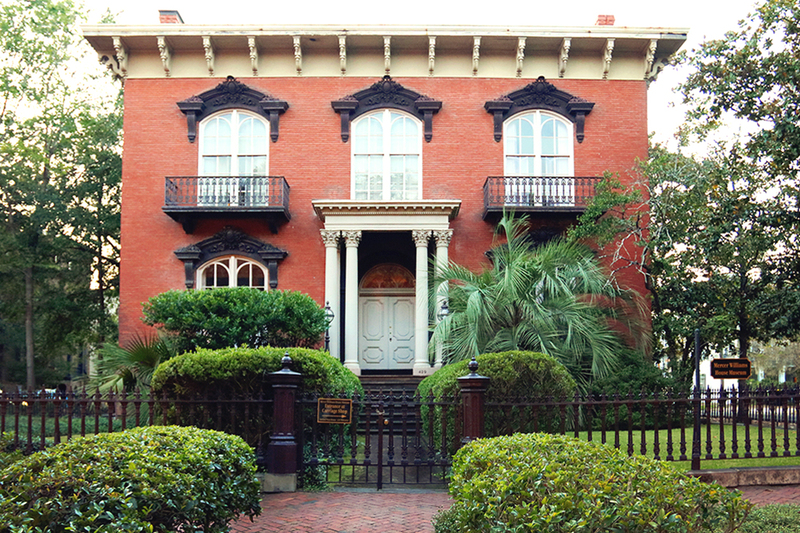 This type of home was prevalent in Germany's Black Forest region, and is one of many gingerbread-style houses in Savannah. [Top] The Mercer Williams House, made famous by the book Midnight in the Garden of Good and Evil. 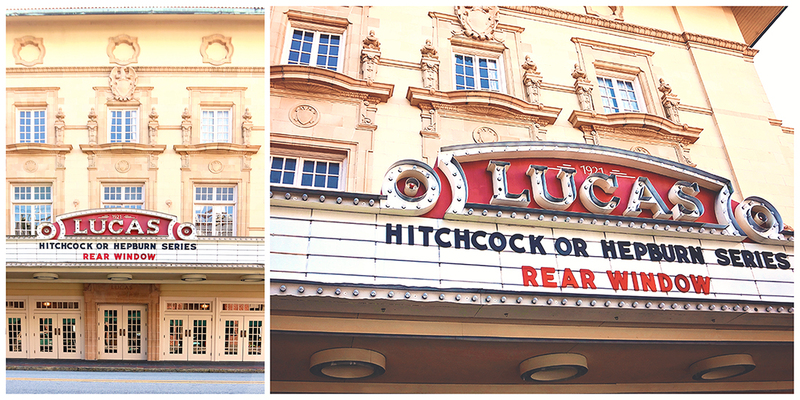 [Bottom] The marquee lights of the Lucas Theatre sign are an iconic sight in downtown Savannah. This stunning home is billed as the “last unrestored grand mansion of Savannah”, and it's not just antiques lovers who appreciate it; the home's decaying beauty is apparent to all who enter through the easily missed side cellar door. Stacks of dusty furniture and gold-leaf mirrors partially cover the cracked plaster walls. The many framed portraits lining the walls look so at home it almost seems a crime to purchase them. Although the house is not meant to be toured, I recommend a stroll through the area to appreciate the details of this Italianate-designed beauty from the exterior. And by all means, do step inside if you're in the market for a few unique, albeit expensive, treasures. This vendor-stye antique shop isn't as intimidating as Alex Raskin's, and the prices are much friendlier on the wallet. My favorite rooms are the book room and the one chock full of architectural finds. Named after owners John & Virginia Duncan and tucked away in the garden level of their beautifully restored home, this cozy shop carries an extensive collection of cartographic finds, botanical prints, vintage postcards, and locally authored books. Once you've entered, you'll likely want to cancel your plans for the remainder of the day. That's especially true if you have the good fortune to delve into conversation with either of the gracious hosts. [Left] V&J Duncan Antique Map Store [ Center & Right] Alex Raskin Antiques. It's very easy to lose track of time in both of these stores! City Market is a quaint little pedestrian shopping zone. You'll find restaurants, live music, galleries, and souvenir shops. It's a decent place to grab a bite to eat and people watch, but neighboring Congress Street has better nightlife. This is a chill spot to grab a giant pizza slice after a busy day spent exploring the city. I kid you not, one slice of pizza is as at least as big as your head — if not bigger! My favorite part of City Market is tucked away in the upstairs area. Head up there to chat with the artists as they work. It's a fascinating way to learn the process behind their pieces. You'll find an eclectic mix of everything from rock to rap at this live music venue. Formerly known as the Velvet Elvis Lounge, the atmosphere is casual and not at all pretentious. Still looking for things to do in Savannah GA after all of the options listed above? Try timing your visit to coincide with one of the city's major local festivals. Established in 1989, this has grown to one of Savannah's largest events. It runs from the end of March through mid April and features some of the world's finest musicians. This festival is typically held in late October/early November and is a star-studded affair! There are daily screenings of independent films, celebrity Q&A sessions, and fun afterparties. It also provides a great opportunity to spot celebrities throughout the city. Explore the best in Southern cuisine at this event, which is held annually in November. Grab those tickets fast, though, because many sell out nearly a year in advance. Prefer to stay in a historic home while you're in town? Here's a $40 Airbnb credit to help out! Finally, I update my Savannah Pinterest board frequently with my favorite local haunts. If you want to follow along, you can do so here. Photo sources: Image of shopSCAD artwork | ©HumungoNation | Flickr CC Attribution No-Derivatives 2.0 Generic. 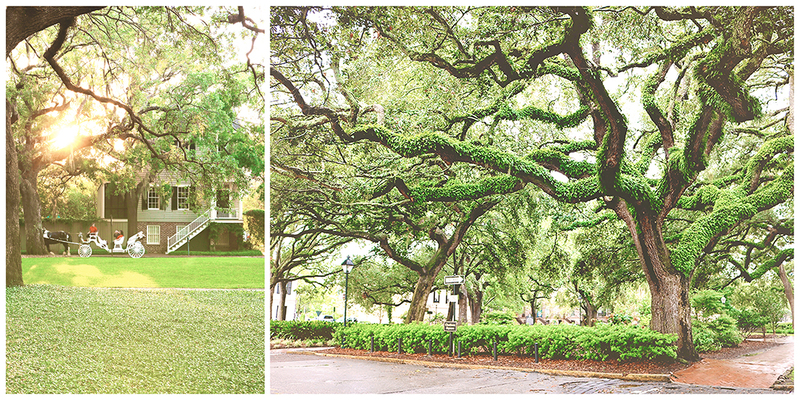 I like ve how charming Savannah is and I feel like I could spend days taking photos of all the beautiful architecture. I would also love to visit the museums and SCAD! That outfit was amazing!! It looks like Savannah has such a Southern charm! 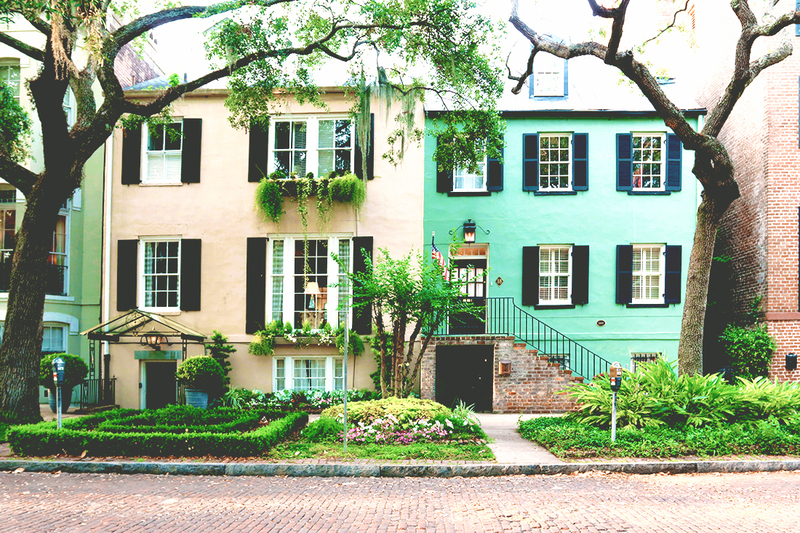 I have been through Georgia briefly but have never been to Savannah, but the beautiful home and old streets make me really want to visit! It’s so cool that certain homes ar open to touring during Christmas! It’s practically oozing with Southern charm. The surrounding areas are, too (Bluffton, Beaufort, etc.). I can wander the streets of the Historic District for hours on end during the holiday season when everything is decorated so beautifully. Wow it truly is like something out of an old fashioned movie!! So beautiful! Definitely like the sound of the food and wine festival! Pinning this to my travel board! 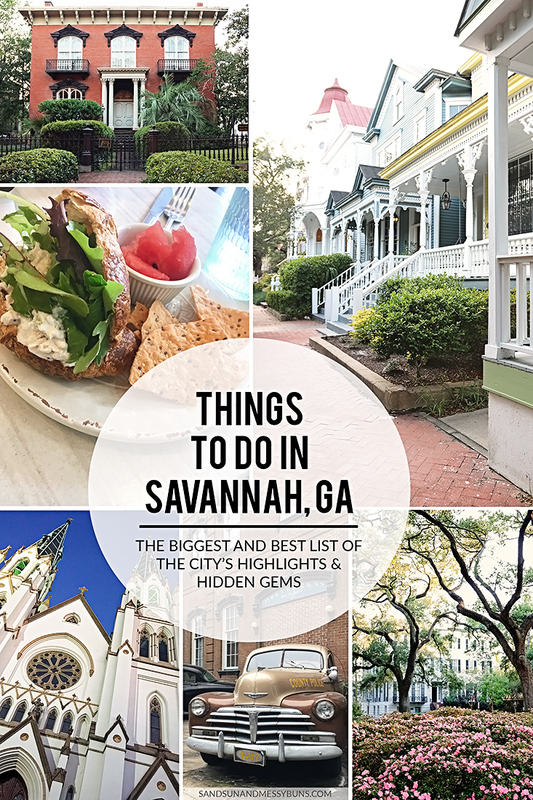 When my husband and I planned our trip to Charleston last summer we also considered Savannah so I’m excited to have this list of references when we eventually do go! Wow, even just your first photo makes me want to go there! SO many amazing places and tips, book marking this page!! !